Teutonic discipline vs Mediterranean passion? We agree. It is just that Toto has the most prominent voice to the media/public, but I did give credit to the broader team. I agree on the Nico part, too. Boy did Merc's setup nightmares begin the moment he retired. They manage around it, but when Nico left, they did lose valuable work/input. Funny, they use the term diva to describe the car at times, something that came to be when Nico was no longer around. There is big money spent on management consulting and sports psychology by some teams. It's no secret, @4Canada , that Ferrari's management-by-fear approach has faded only slightly over the years, and has damaged drivers and team members over the years, sometimes driving talent away. Binnotto's approach appears more modern and progressive, and this is worth watching. During the glory years, the collection of Ross Brawn, Rory Byrne, Nigel Stepny and Michael Schumacher were mentally tough enough to wrestle control and/or simply power through the Italian politics and management style. Last edited by chimera; 04-10-2019 at 03:49 AM. I lost patience, went to http://redbubble.com and purchased a Kimi, Alfa Romeo Racing T-shirt. 4Canada and goldmax like this. Edit - F1 won't let you embed their video - you have to click the link that comes up to watch on YouTube. Ferrari and Merc are just hundreths off eachother after quali sims through FP2. Ferrari is working the medium and softs well. Merc is only working the softs on par with Ferrari. Hamilton struggles on both compounds. He looks like Bottos does when he struggles. Pirelli have adjusted rear tire pressures to a lower number than the first two races. The F/R dynamic is very different. 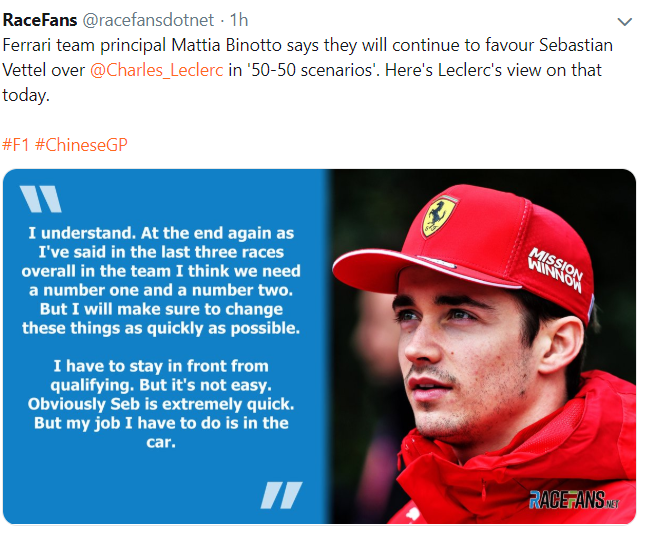 Ferrari had a limit on LeClerc's laps in FP2 to 'check a cooling issue' .... so he never did a run on the track after it was well seasoned with rubber and getting faster. Alfa Romeo: Kimi and GIO were down near bottom and Kimi kept tweaking the car til he got into 12th. Ferrari switched out some electronics on Haas and Ferrari cars, but not on Alfa, further suggesting the Ferrari and Haas have pursued more aggressive cooling solutions (more risky) and have put parts and reliability in jeopardy. There are no penalties for replacing these parts. Don't be surprised if the do it weekly (although packaging changes due for Canada might be permanent fix). EDIT: There is debate here. Teams can use TWO electronic control boxes per season, but there is other wording in assorted rules about some parts that can be adjusted for reliability or safety concerns. So, definitely not an unlimited supply, but questions about whether the seals on the parts can be broken and the part modified for reliability only (no enhancement). The F1 rulebook is as complex as its cars! In the USA Eastern Time Zone, last of practices and the Quali happen late Friday night and then past midnight (technically Sat morning). Race pace sims show Merc with similar advantage over Ferrari as seen in opener at Melbourne. Data crunchers and steering wheel spies report Ferrari running base engine modes again. LeClerc's runs shortened by cooling concerns. Ferrari straight-line speed missing (like Melbourne). EDIT: Lost something in translation, but better explained as this: Ferrari leads on the straights, but with new spoon wing and other data, should be even faster given the two straights, with one the fastest, longest in season. Appears Ferrari cannot tap into the MGU-H heat trickery at this point after giving it a go in Bahrain. Last edited by Philster; 04-12-2019 at 09:46 AM. He looks at it realistically - his job is to go as fast as they let him go. He still takes home his cheque. He knows that his time will come - and he's still closer to the top than he would have been had he stayed with Sauber. The trick will be to protect the tires and try to get ahead of Seb after pitting. There's precious little that the team can do about that. Except perhaps de-rate the car (and I wouldn't put it past them to do that). Philster and RYUK like this. Is it me or does all this reliance on computers, tire compound, mechanical and aero tricks, take a lot of the fun out of F1. When the car becomes more important than driver skill....kind of takes the human aspect out of racing. Sorry if I raised an old issue....but I like to see a driver beat another drive because they were more skilled and/or didn't make mistakes that others could capitalize on. Perhaps at some point in the future race cars will be completely autonomous....no driver needed. It would be a pure test of engineering and design.....but boring as hell. When I see old F1 races with the greats like Fangio, Clark, etc. I see real drivers with superior skills that win the race...not the other way around.